Anyone who has known me longer than a day knows I am a Michael Jackson nerd. Specificaly about his work from 1968 to 1987. I am a product of the 80's and remember Motown 25 and the premiere of Thriller fondly. You're not going to see me on Hollywood Blvd crying over his star or anything,(I will gladly attend a very exclusive, organized , historiacl memorial you can only attend if you happen to be one of 8,000 people out of 1,700,000 chosen at random. ),but I have always had a great admiration for his craft , passion and work as an entertainer. In a world filled with kids who want and expect everything for nothing , Michael Jackson is the constant reminder of working on , researching and honing ones craft. Why will no one in entertainment ever match what Michael has done ? This is why: No one in entertainment history has ever or will ever work harder and learn more about their craft than MJ did. 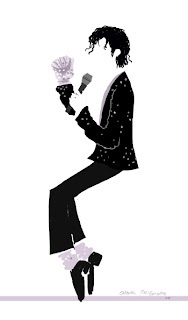 When he was 10 years old MJ studied other performers, broke down their process and art , and perfected it! As he grew he started looking outside of his own craft and started to study and incorporate all art. He studied the sculpture of Michaelangelo for the design of a pose. He studied Charlie Chaplin , Buster Keaton , and the great mime Marcel Marseau for the design of movement and silhouette. He studied Gene Kelly and Fred Astair Dance routines relentlessly , getting to the essence of their performances. 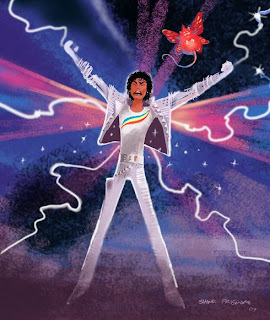 The reason MJ wore short tight pants and thick bright socks (Motown 25 , Thriller , Beat it) Is because Gene Kelly did that to create a clear silhouette and make the feet the focus of the performance. You can track these bright socks like anchor points for the movement. 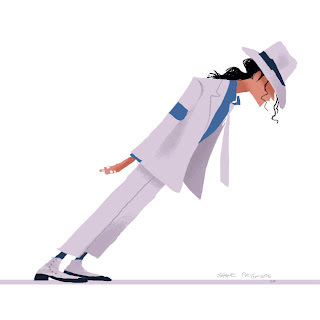 Jackson studied Indian Dance , the movement of sports athletes , Sword play and fencing , He studied animation for movement. Michael searched out the best street dancers , found them, and learned most of his moves (Moonwalk , Hits , Glides, etc...) from Bugaloo Shrimp , POPPIN TACO , Poppin Pete, Shabadoo, Sugar Pop , Hugo Huizar , and all the Electric Boogaloos out here in California. That is straight from Kid Flash(Pete Gomez)who was part of it all. Taco and Poppin Pete are seen leaning on either side of MJ in smooth criminal(Moonwalker), and are the first two pop locking prisoners MJ frees from their pillar prisons in Captain EO. AMAZING! AND so much more. THEN MICHAEL APPLIED EVERYTHING HE LEARNED AND HONED IT WITH HARD WORK and tireless experimentation ! It is so easy to brush off accomplishment , craft , and passion like that with all the weird stuff surrounding Michael Jackson. And yes I think it is really weird and sad too. But , man that guy was talented. He knew entertainment like nobodies business. I was at Disneyland on Thursday , June 25th 2009. I was eating a Dole whip in front of the Tiki Room when someone in the crowd started talking about it. I had to interrupt the person and inquire. The person said: "yeah I just got a text about it." I said "What? Come on." Then other people started getting phone calls and texts. More murmers. Then the guy I asked pulled up a news web page on his phone : " MICHAEL JACKSON DEAD". WHAT ? Now everyone was talking about it. Friends were calling me. Then from all over Disneyland you started to hear people yelling: " Michael Jackson Died!!! "Everyone was talking to everyone else about it. "They need to bring back Captain EO in remembrance"... some woman said. Then a couple hours later I was sitting in Tomorrowland (home of Captain EO) , when Suddenly the Tomorrowland stage starts to rise and a very distinctive beat starts playing: "So you wanta be startin' somethin' , got to be startin' Somethin'"... People started cheering and running towards the stage. It was NUTS!! Everyone was dancing . Then immediately after that they played Thriller! By this time people were just mobbing the area . It was so surreal. So here are some MJ doodles....Quick impressions of some of my favorite MJ moments over the years. HEEEE HEEEEEEE ! WHOOOOOOOOO!